This is the place where we've put everything that doesn't sit anywhere else. However that's not to diminish the work done on the helmets, masks and props in this section as some of them are among the most impressive we've seen in the hobby! 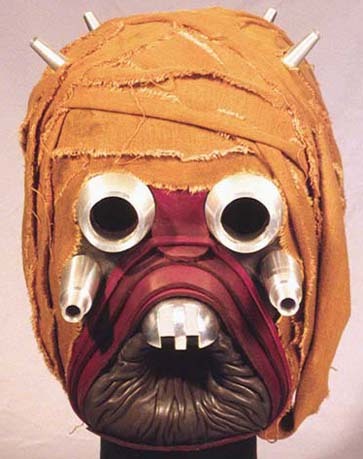 Click here for Masks, Helmets and Costumes based on the "Good Guys"
A Wretched Hive of Scum and Villainy! 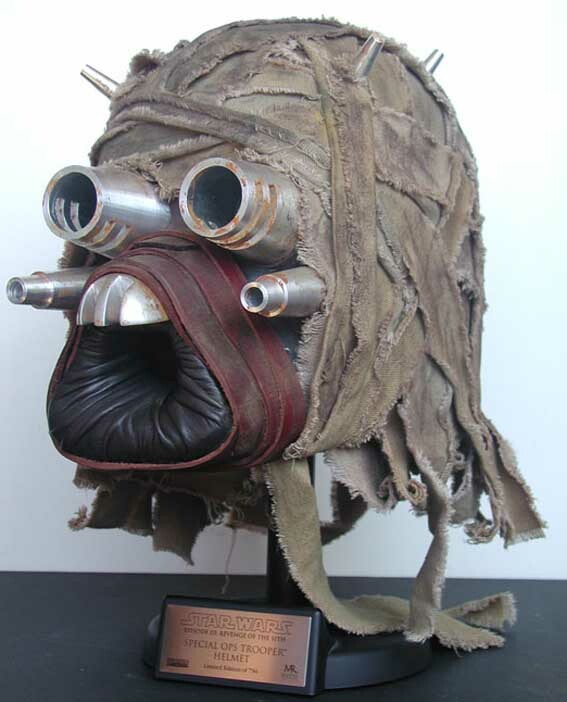 Here's a Tusken Raider mask I made from one of Godzilla's excellent kits a few years back. 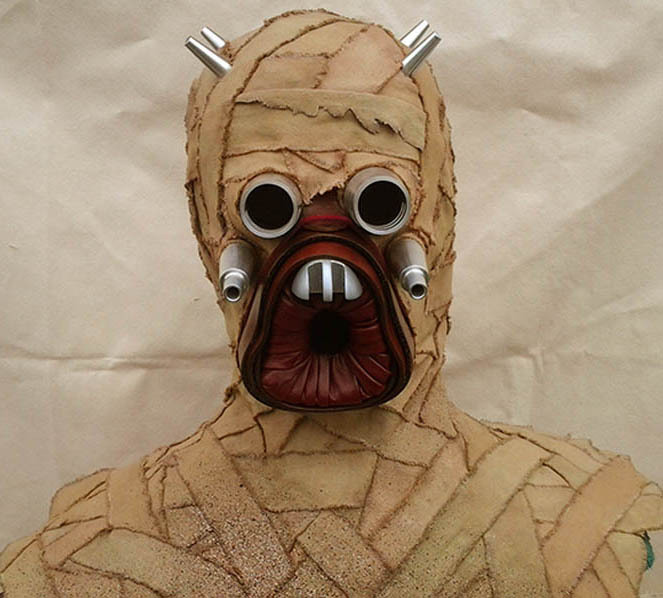 If you manage to get hold of one of these they're great fun and are looking for some tips on how to put this together plus a few more pics of the complete mask then check-out our Tutorial on it. Its based on a Godzilla kit and was great fun to make. 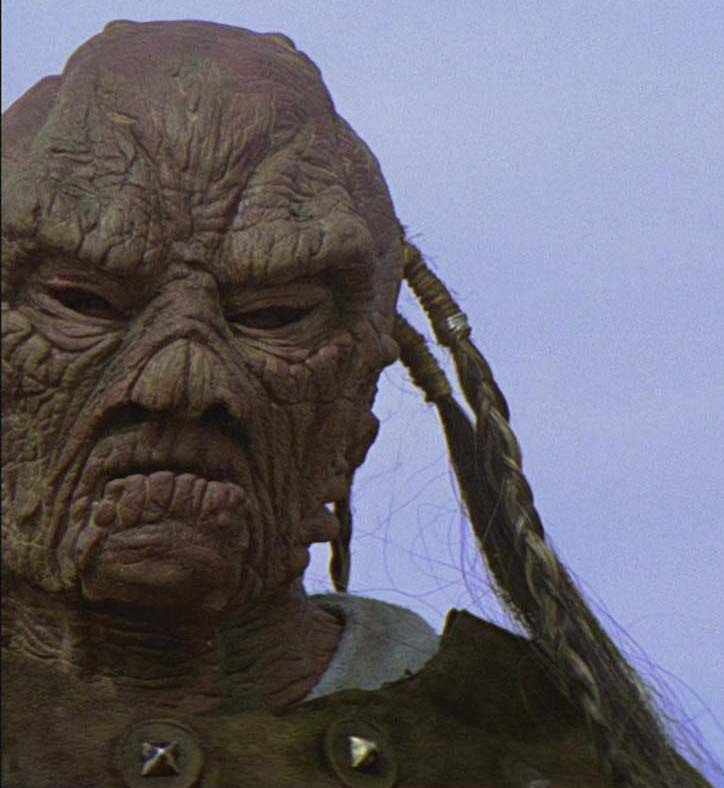 I've weathered it a bit to give it a bit of a dirty, "got lost in a Tatooine sand-storm" kind of "used" look. 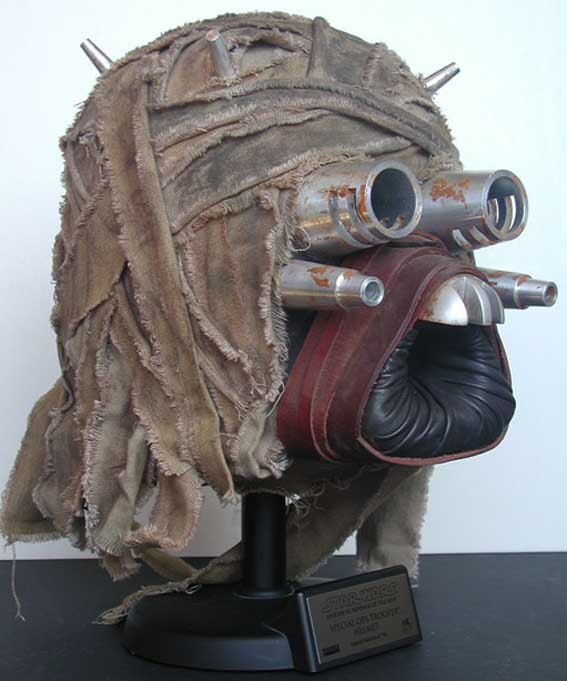 July '09 - Here are some new photos of my Godzilla Tusken mask/helmet taken just last week. Its been a few years since I've photographed this and I wanted to show off just how cool this kit is. I could probably do with adding a wee bit more weathering to mine, but otherwise I'm really pleased. The newer version of this kit has an allow "nose" section so is arguably even better. The kit is really great since it comes with everything you need - including glue! Below are a couple of shots of the same kit, this one done by the kit creator, Godzilla. machine screws for fastening. 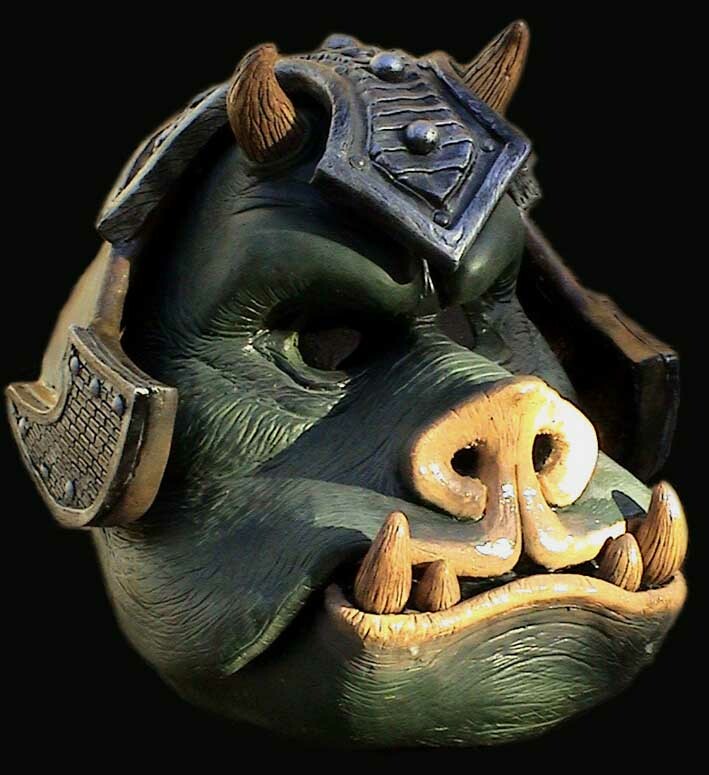 the nose piece is resin cast, includes adhesive foil for an accurate finish and It's a little-known-fact that this piece on the original mask is actually plastic. 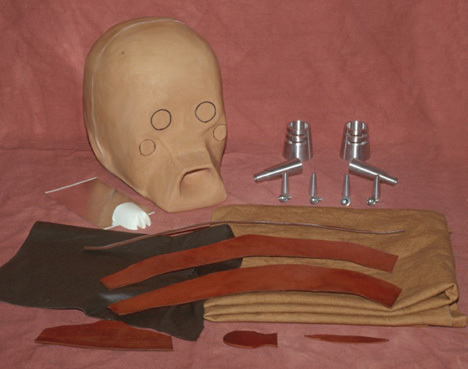 The inner mouth is leather, with custom-dyed cowhide (yee-hah!) for the outer mouth. Finally the fabric on the head is accurate in colour, weave, fiber, and weight to the original masks. I really like the "rust" he's added to the eyes to make it look even more weathered. I finished mine about 3 years ago and he's been sitting (on some WW 1 bandoleers) in a glass cabinet since then. I think I may need to get him out and dirty him up a bit more! Below, nice Beauty shot from Ben - although sticking it on an MR stand may give them ideas! 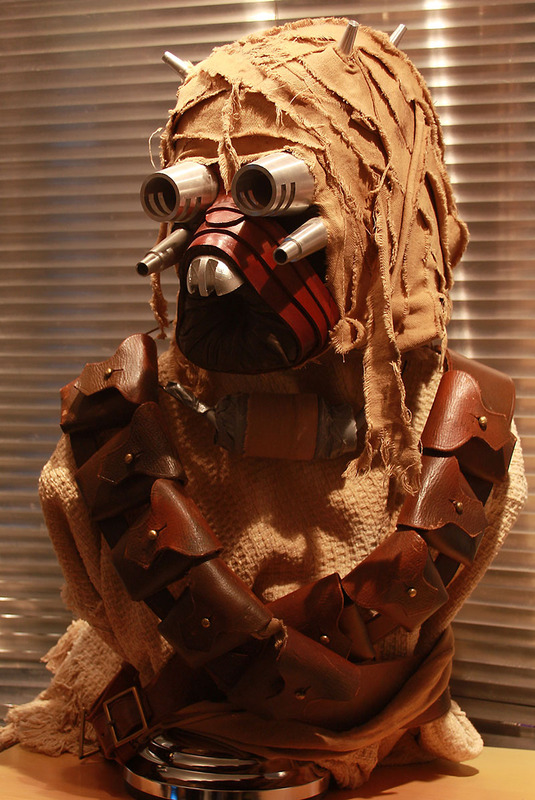 While on the subject of Tusken Raiders, Damian/TK826 from the 501st Midwest Garrison (he's their Membership Liaison and one of its founding members). 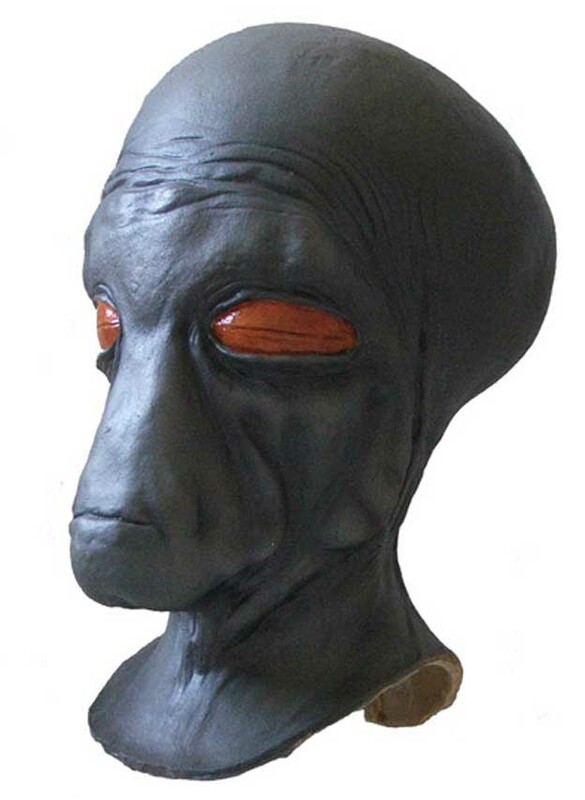 Damian makes these great mask/busts to order such that each one is custom built to the buyers individual measurements. The bust above is #007 and is on its way to the buyer in London right now - nice work Damian! 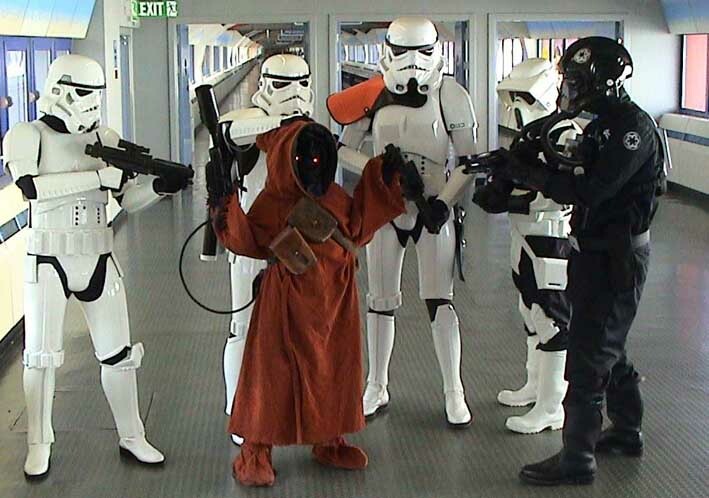 For more info please contact the 501st Midwest Garrison. Uuuutiniiiiiii!!!! 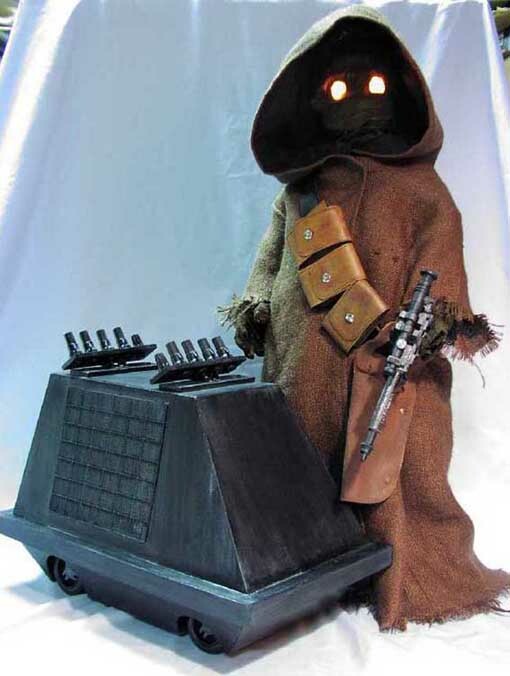 You've gotta love Jawa's. Dirty disgusting creatures they may be but they're also the one creature in the universe that can just about piss anyone off! Nicking Droids and selling them onto any unsuspecting moisture farmer, they're small yet carry big guns (bet Freud would have something to say about that!) and they're also the chosen costume for many a wee lad wanting to join his dad's Garrison event. 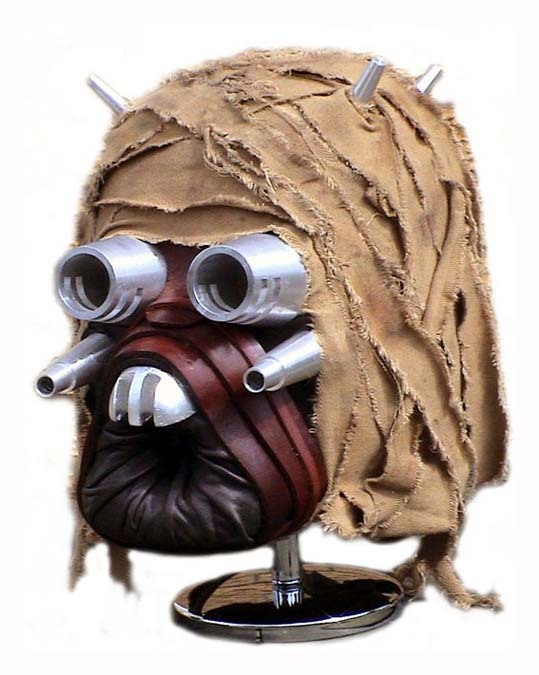 ...and below the de-regeur Jawa-bashing photo. Poor chap! Just when his wife must be saying "look Richard no more, there's just no more ROOM", the man at Riley Replica's decides to scratch-build this the most vile 12 ft long Gangsta in the Universe! 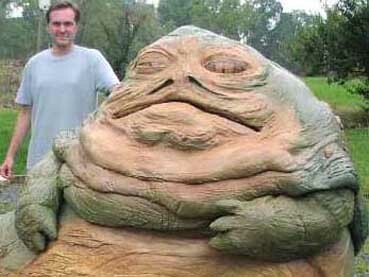 ....and here he is, the man himself (Richard) next to his creation. Unfreaking believable!! 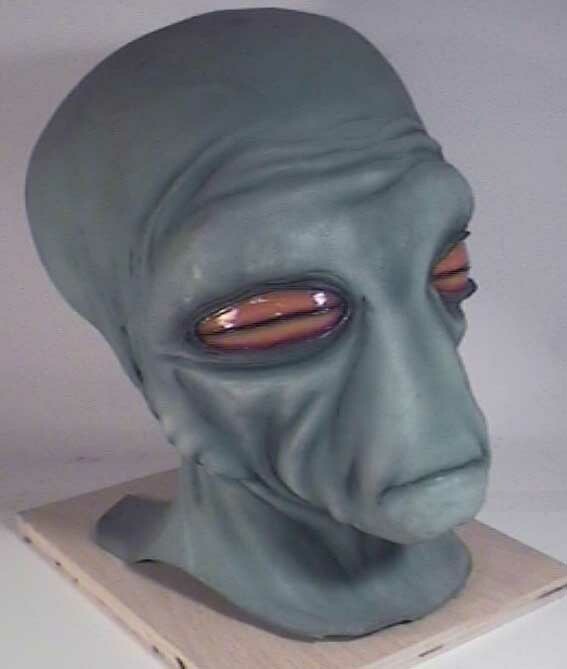 He's is made from Styrofoam, coated with an acrylic sealer and then covered with cloth that is then coated again with the sealer. While it is still wet he makes the wrinkles in the skin with his paint brush. After all of that I then paint the sucker with interior house paint. So what's his next project going to be? 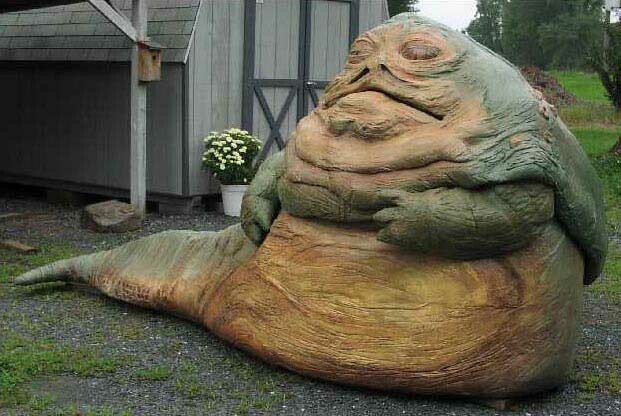 How about a life-size Rancor!?! 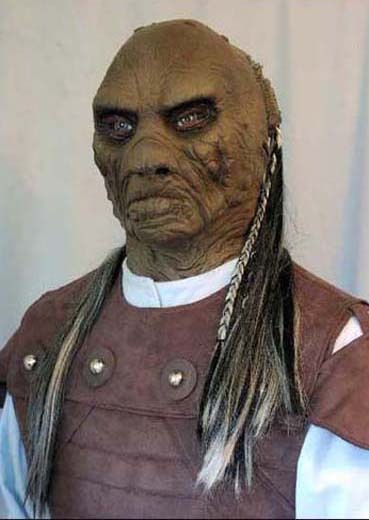 Using the cheap Don Post Weequay mask as a starting point, Richard's added to fabulous detail to the head and face, and constructed the following excellent lifesize. 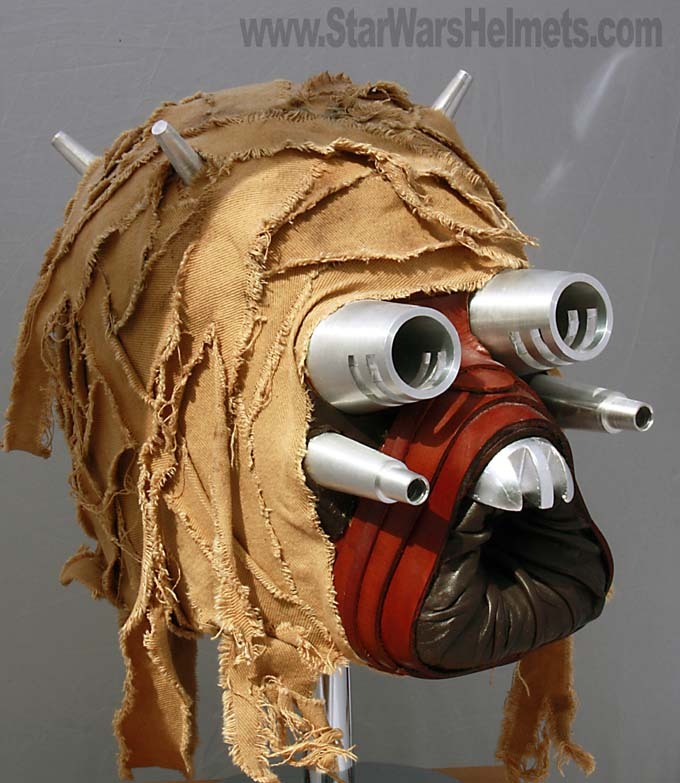 ...and below another unusual Star Wars Character, again by Riley Replica's. 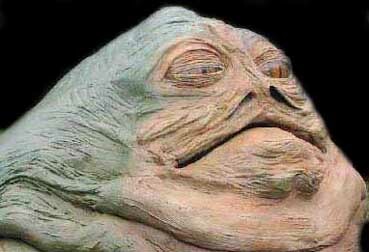 This one is the "blink and you'll miss him in the ROTJ Jabba's Palace" Ammanaman. 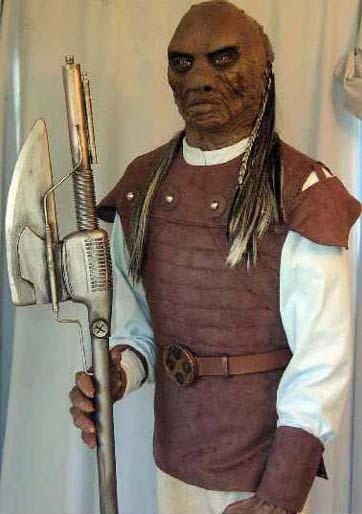 Despite looking somewhat of a wuss I'm told he's a hard ruthless killer. Either way its another excellent scratch-built life-size from Riley Replica's. Here's another couple of pics, the one on the left is of regular contributor KL and on the right another photo of one of the Riley Replica's. I'm really pleased with this - I got it this week (Sept 05). 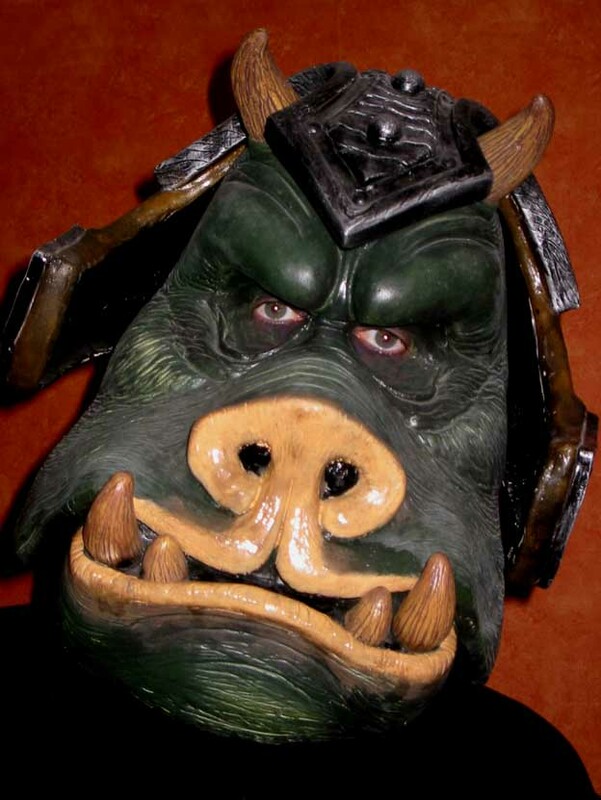 Its a latex Gamorrean Guard (obviously) and its a full face mask with resin tusks/horns and a fiberglass "helmet" attachment. 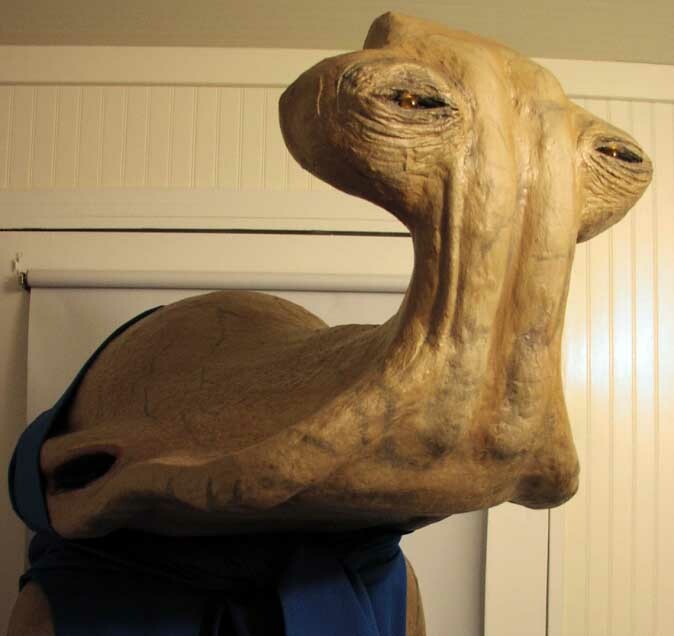 Made by a UK prop maker a few years ago in small numbers, he also made the full body costume! Above, with yours truly wearing it and below where he should be, safely behind glass! Again, below a screen grab from the movie. 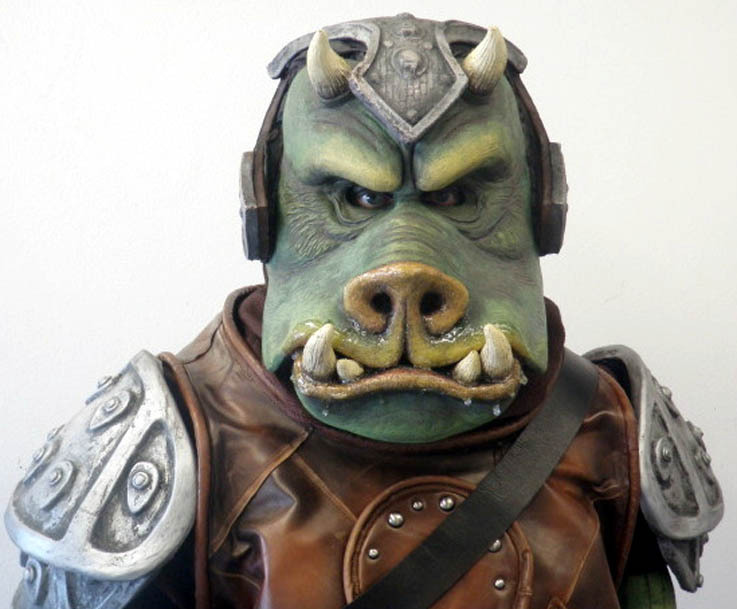 These next three shots below are of a FULL BODY Gamorrean Guard costume - this one owned by Craig McKeeman from California's finest 501st. From the looks of it that head looks exactly the same as mine, seen earlier. Yep - its official - it looks freaking awesome! Below a great full body shot of the complete costume - HUGELY impressive! Riley Replica's has again come up trumps with this one-off hammerhead. 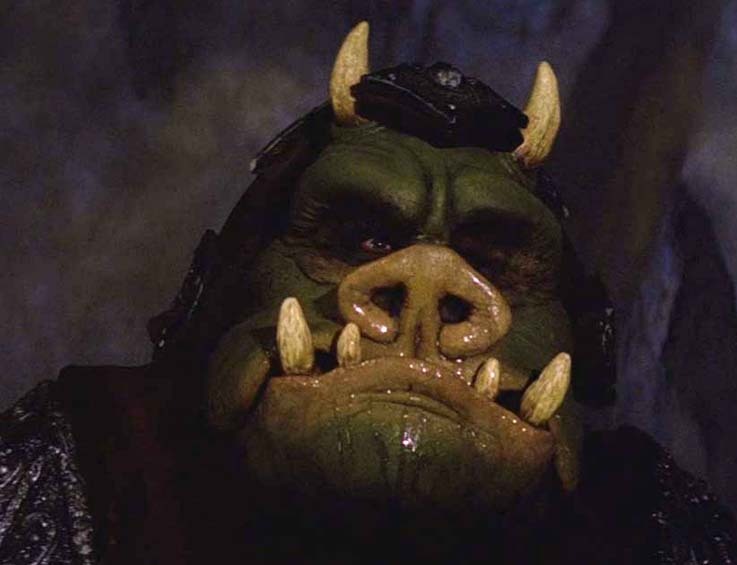 Now I'm not sure whether this guy is good or bad, although I remember having a number of skirmishes with them in Dark Forces 2. Either way it looks wonderful. 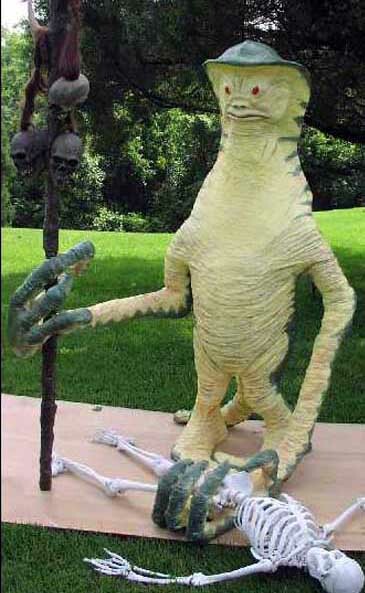 It's actually carved Styrofoam, and he coats the foam with a product called "sculpt or coat" and then place a layer of cotton batten on it to cover and protect the foam. While it is still "wet" he carves the detail into the head using the end of my paint brush, instant hammerhead! 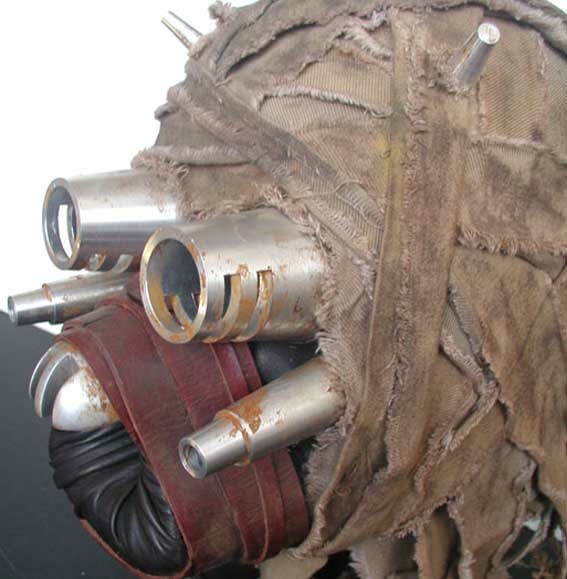 The costume is custom and is a cross between the old toy and the production sketch. Awesome! 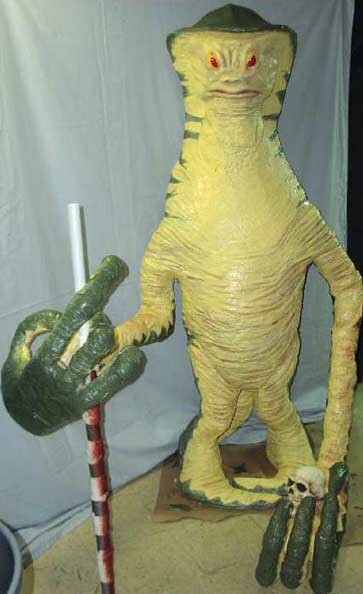 While on the subject of Cantina creatures, Tim sent me these pics of his Duros, which the owner says was cast from the original 1976 moulds! 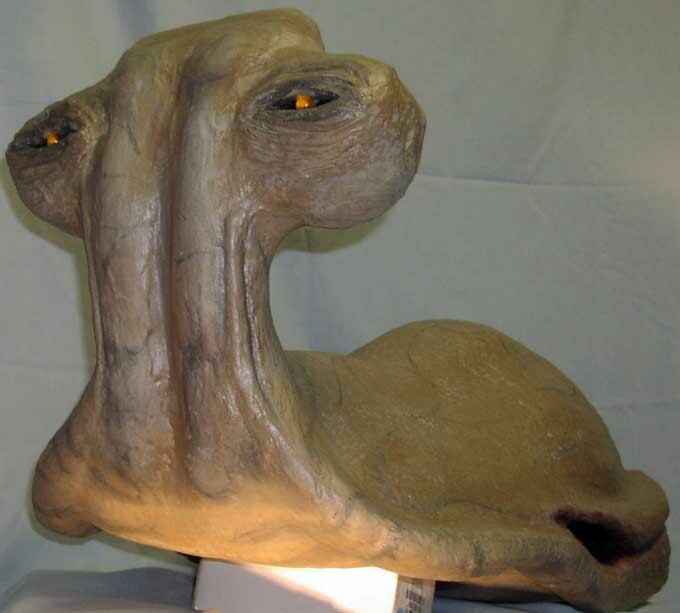 The owner Tim explains...It was cast from the original mould based on the sculpt by Phil Tippet. 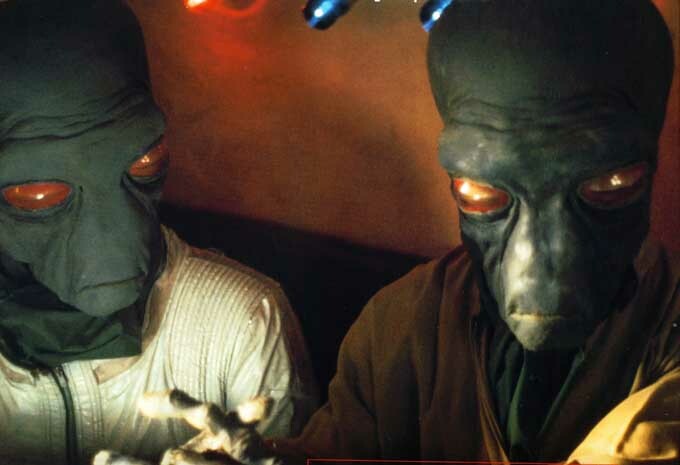 Phil was working with Rick Baker back in 1976 when they were hired to do some of the cantina creatures. 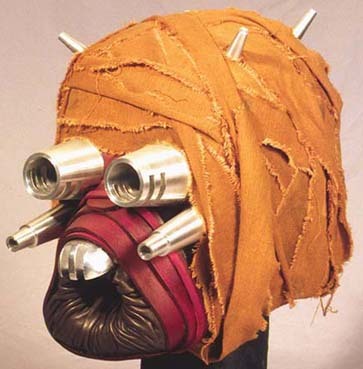 This mask was an extra backup copy as the monster makers like Rick Baker would produce several copies in case of wear and tear on the set. 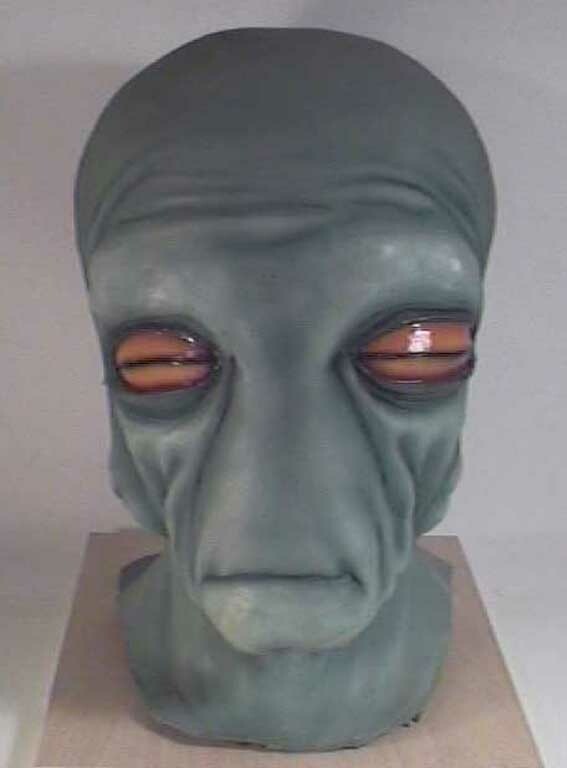 Its an interesting artefact and as you can probably see it has no eyeholes or mouth holes and was made strictly for background character use. Well if Tim's correct that its a very important (and valuable) piece. 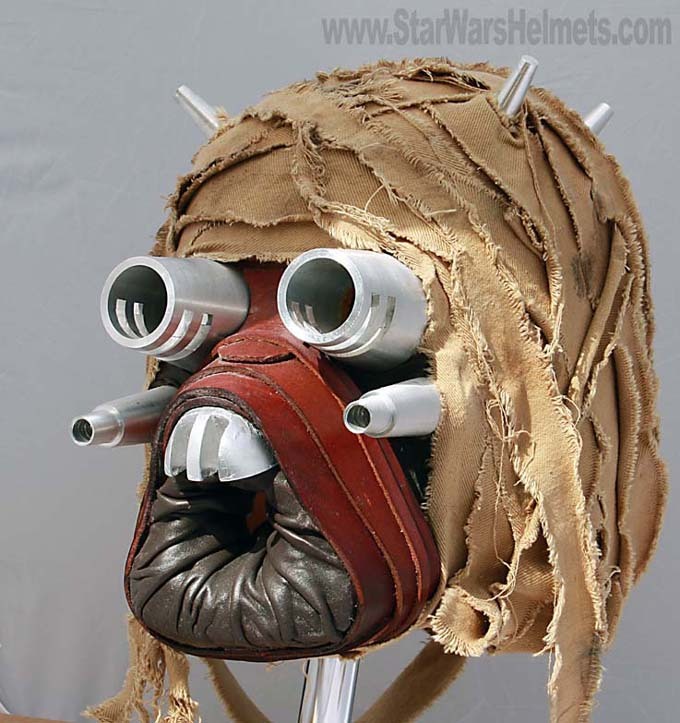 Click here for miscellaneous Masks, Helmets and Costumes based on the "Good Guys"